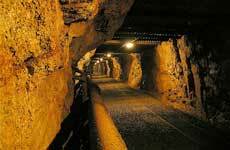 In mid-2009, an employee sustained fatal injuries when he fell through a grizzly installed over an ore pass at an Eastern Goldfields underground mine. The employee had been instructed to cover the grizzly to prevent dust coming from the pass. Prior to the accident he obtained two sheets of mesh and ventilation ducting from a storage area and transported them to the ore pass. Two pieces of ventilation ducting were put on top of the grizzly and the first sheet of mesh placed over half of the ducting. It appears that, while installing this sheet of mesh, the employee fell through one of the grizzly openings to the broken rock about 25 metres below.